Select your Star rating above in each Category and Click "Submit Your Rating" Write a Review of your Visit of Willamette Wine Country RV Park. .
Nestled on the bank of the Yamhill River in Oregon’s scenic Willamette Valley, Willamette Wine Country RV Park (formely the Portland-Dayton RV Park) is known for its quiet, friendly atmosphere. Nearby you'll find wineries, live music, golf, casinos, historic small towns and an aviation museum. 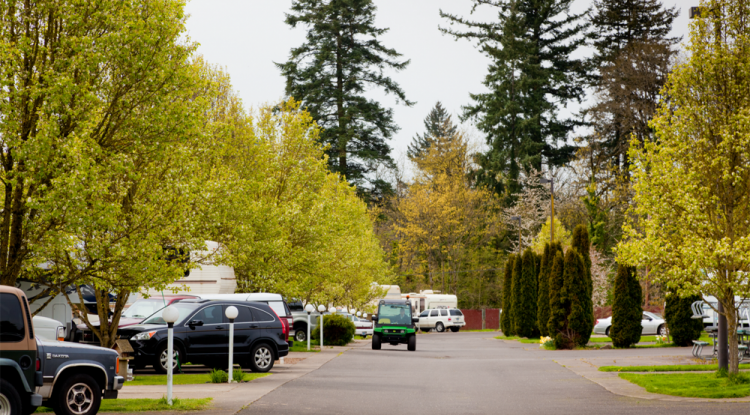 From Willamette Wine Country RV Park 's location in the Willamette Valley, you’ll be close to dozens of wineries and restaurants, the Evergreen Air & Space Museum, Spirit Mountain Casino, golf courses, the historic town of McMinnville, and much more. Take Interstate 5 South to the Tigard (Exit 294), merge onto SW Barbur Blvd/OR-99W toward Newberg/Tigard Continue to follow OR-99W (22.6 mi.). Left at SE Dayton Bypass/OR-18 W/OR-233 S (0.9mi), Turn left at Willamette Wine Country RV Park (SE Kreder Rd). Take Highway 205 to Interstate 5 South. Take the Donald Exit # 278 and turn right. Stay on that road for approximately seven miles at which time you will come to a stop sign; turn right and continue into Newberg until you reach Highway 99 West. Turn left onto Highway 99 and follow the signs to Highway 18; Willamette Wine Country RV Park is approximately 1 mile on the left. Take Interstate 5 to Salem. Take the Marion Street across the Marion Street Bridge/OR-22 West and take the ramp towards West Salem Business District. Take the Edgewater Street ramp. Turn right onto Wallace Road NW/OR-221/Salem Dayton Highway. Follow signs out of Dayton to Highway 18; after crossing the Yamhill River, Willamette Wine Country RV Park will be on your right. Travel Highway 18 to McMinnville. Continue past the Dayton exit; cross the Yamhill River and Willamette Wine Country RV Park will be on your right.